When you become an active member of the Alumni Club, you not only enjoy the benefits of our network of influential and professionally experienced alumni contacts, you are also supporting the continued growth and development of the university department. The Club has plans to develop additional benefits for its members. Join now! With your help, the Club can accomplish its mission of providing outstanding support for our department and its alumni. See Volunteer Opportunities to inquire how you can help out. 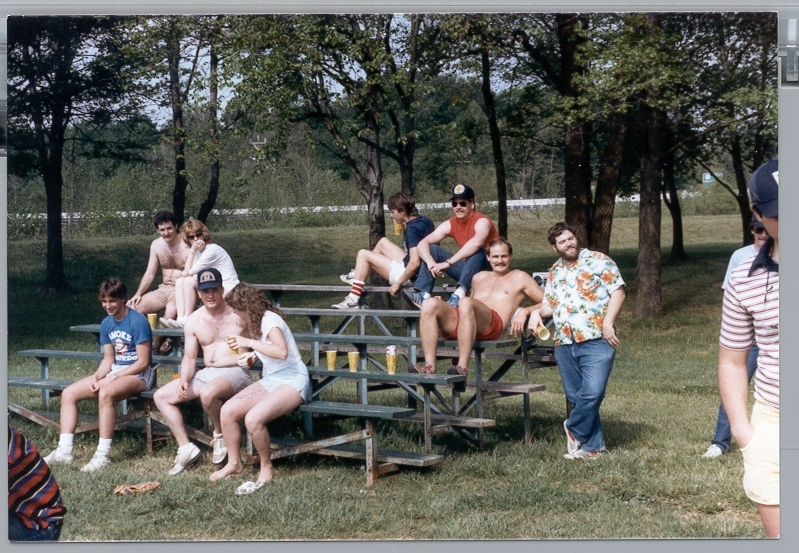 Confirmed in the picture is Tom Gardner (middle far left), Bob Tabet (bottom left in blue shirt), Dan Bridgett (middle sitting – no shirt & no hat), Craig Christenson (standing – Hawaiian shirt), unconfirmed is Ivan Humberson (glasses and hat), to the left of him, unconfirmed is Dave Purcell, bottom sitting – no shirt with hat is unidentified.